Along with the rest of the country, Chhath Puja was celebrated with full devotion in Tripura’s capital Agartala. Hundred of devotees mainly from the Bihari community gathered at the Khejurbagan lake to celebrate the festival. During Chhath devotees pray to the Sun god Surya, the source of energy and sustaining life on earth and for their well-being, prosperity and progress of one’s family. Devotees in their traditional attire took a dip in the lake and prayed to the setting sun with their offerings. In Hinduism, Sun God is considered as the god of all life-force and energy, which is why worshiping Surya is considered to cure many diseases, including leprosy. The Sun God is also said to ensure the longevity and prosperity of family members, friends and elders. Women perform the rituals of Chhath puja for the well being of their husband, children, better family life and so that their wishes come true. 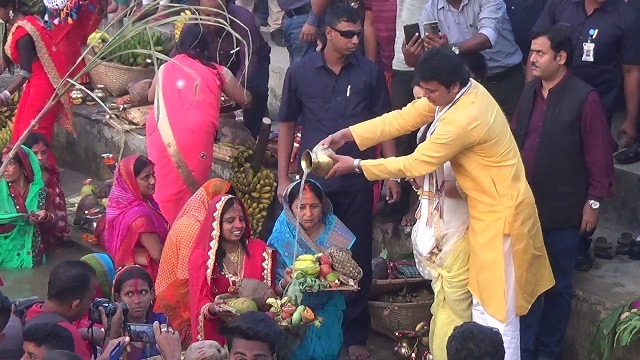 Tripura Chief Minister Biplab Kumar Deb along with wife Niti Deb took part in the celebration. This is a four days festival and on the Hindu month of Kartik, the puja starts by holy bathing, fasting, abstaining from drinking water (vratha), on the seventh day by standing in water for long periods of time and offering prasad, prayer and arghya to the Sun as it rises and sets. Chhath Puja, which also worships Chhathi Maiya or Goddess Usha, an ancient Vedic goddess personification of ‘dawn’, is performed on the sixth day of Kartika in the lunar calendar and falls in October. The rituals of the Chhath Puja are quite rigorous, with devotees observing fast for 36 hours. Chhath Puja followers are also expected to be pure by heart and give up luxurious lifestyle and follow a low-key one during its course. While the Chhath Puja is all about worship and rituals, music is an integral part of it.